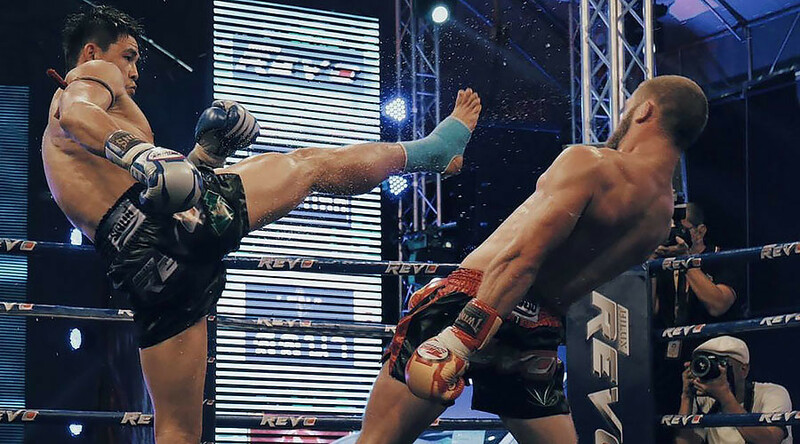 A superflexible Muay Thai fighter, who went viral when UFC President Dana White tweeted a video of him bending backwards in a 90 degree angle to dodge a roundhouse kick, says he would fight in the promotion for free given the chance. Twenty-three-year-old Rafael Fiziev from Bishkek, Kyrgyzstan was competing in the ‘Thailand Toyota Marathon’ Muay Thai tournament in Bangkok on January 27, when he executed the stunning defensive move in his fight with a Thai opponent. But it wasn’t until a video of the moment was uploaded onto YouTube a few days later that he suddenly found himself in the limelight. “I couldn’t believe that Dana White actually tweeted about me” Fiziev told RT Sport. RT: Do you compete in mixed martial arts [MMA] yourself or are you solely Muay Thai? Rafael Fiziev: I do. I’ve had two professional MMA fights – both are victories. Although my record on sherdog.com shows only one fight for some reason. But I had a large number of MMA fights on tournaments that were not registered. Plus a lot of Muay Thai, K-1, and Jiu-Jitsu bouts. RT: You come from Bishkek, Kyrgyzstan – are you familiar with UFC fighter Valentina Shevchenko? RF: Yes, I am. In fact we train at the same gym. I consider her coach, Pavel Fedotov, my mentor. He is also the head coach of the Kyrgyzstan national Muay Thai team that I compete for. We have sparred with Valentina many times. We have a very warm relationship with her and her team. They all are very nice people. When I came to our gym in Bishkek when I was 11, Valentina was the best example for us. We looked up to her technique and her work ethic and of course I watched all of her fights. RT: Do you think you could also compete in big promotions such as UFC one day? RF: That has always been my dream. To be honest, I would even fight for free in the UFC, if Dana White asked me to. This is where all the best fighters are. This is where you can really showcase your ability. I wake up and go to bed thinking about it. That is what I dedicate myself to and work hard for. That is my goal. RT: Talking about the lean-back defensive move that amazed so many people, how did you manage to do that? RF: We always work on that move with my coach during training. You have to be supple if you want to compete in Muay Thai. It’s very important for Jiu Jitsu and freestyle wrestling as well. So I work on it constantly and perform that move quite often. Maybe not as far back as it was that time, though. But yes, this isn’t new to me. Before that tournament we worked a lot on it with my coach. So it did help me during that particular fight. RT: People now call you ‘the Matrix fighter’ because your move looked similar to the ones from The Matrix movie, where Keanu Reeves’ character was dodging bullets, but you have your own nickname – ‘Ataman.’ Could you tells us a little bit about that? RF: Ataman is the title given to Cossack leaders. I actually have a funny story about it. When I was a kid, my dad asked me one day: ‘who is the Ataman in your class?’ meaning who is the leader. I didn’t even know what that meant, so I said, ‘I don't know, but not me.’ He said ‘you should be one!’ So after that I told all my friends that I will be the Ataman of the class (laughing). Many years later when I was competing in a Muay Thai tournament, we had to pick a nickname for me. I didn’t know what to pick. So my coach Pavel Fedotov said that he will pick one for me. When they announced my name, I heard ‘The Ataman’ and I remembered that I used to call myself that name as a kid. So I though that might be fate. If people want to call me ‘The Matrix fighter,’ that doesn’t offend me in anyway. But I’d rather stick to my original nickname, as I got it from my father and from my mentor.